Garden Bloggers Bloom Day - January 2018 - with bonus bugs! I didn't even post last month for Bloom Day. I guess I'd just had enough of 2017, and was happy to leave it behind. Now it's January - a new year, a new season of gardening, and I'm already stoked to get started in the garden again. So let's see what's out there on this uncharacteristically dry day in the middle of winter. 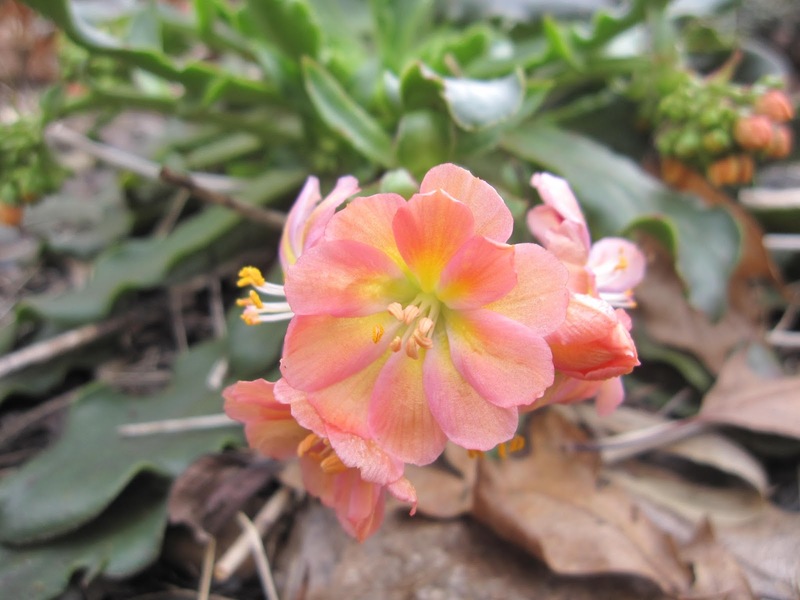 Lewisia cotyledon 'Sunset Series' is flowering! You could have knocked me over with a feather when I saw it. This just shows you how mild our winter has been so far. It's so different from last year at this time when we had the-snow-that-would-not-go. 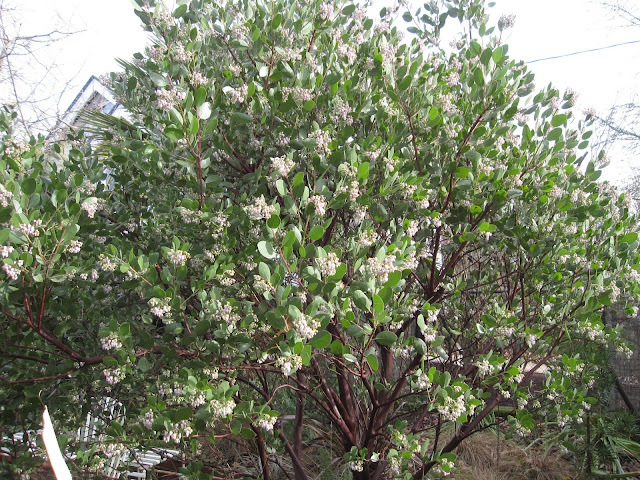 Arctostaphylos x 'Austin Griffiths' is enticing hummers from far and wide. He's blooming right on time, although his flowers seem a little paler than last year. 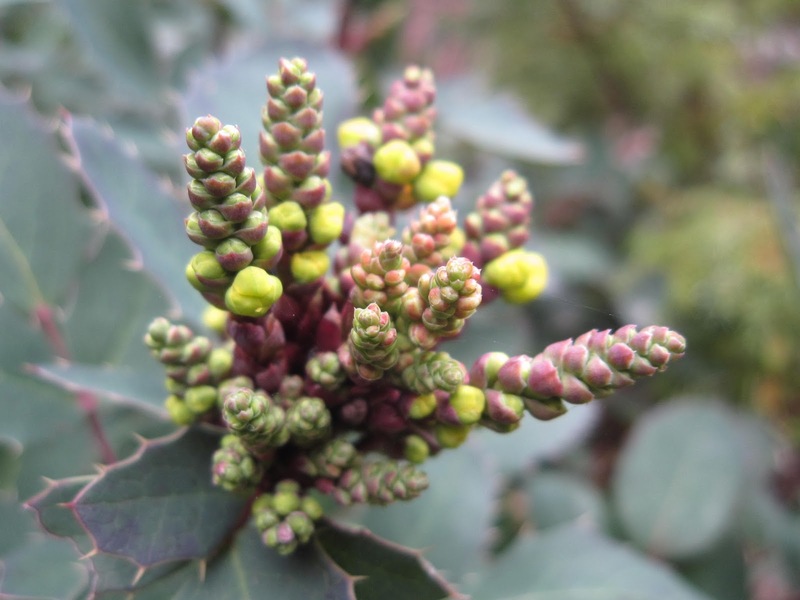 The buds of Mahonia repens are just beginning to break. It's quite early; last year they weren't at this stage until March. 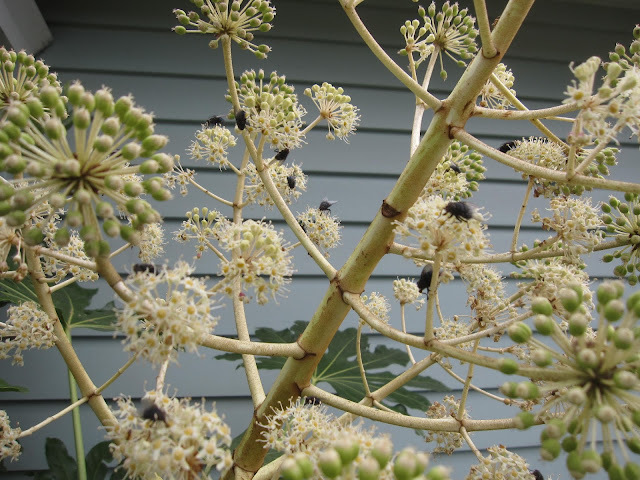 Fatsia japonica is still blooming, and it's swarming with flies! I can't smell anything foul that would attract them, but something apparently is irresistible about these blossoms. It doesn't do much for me, aesthetically, to see flies all over the flowers but I do find it oddly fascinating. Camellia sasanqua 'Yuletide' rebounded after some cold, wet days and is blooming again. 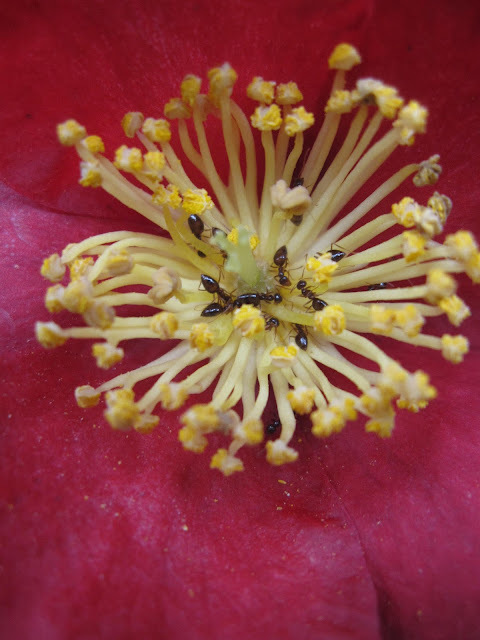 Getting up close to shoot an individual flower, I noticed that there were some ants feeding on its nectar. In fact, there were so many ants on each open flower, they looked like a new black detail in the center of the golden stamens. 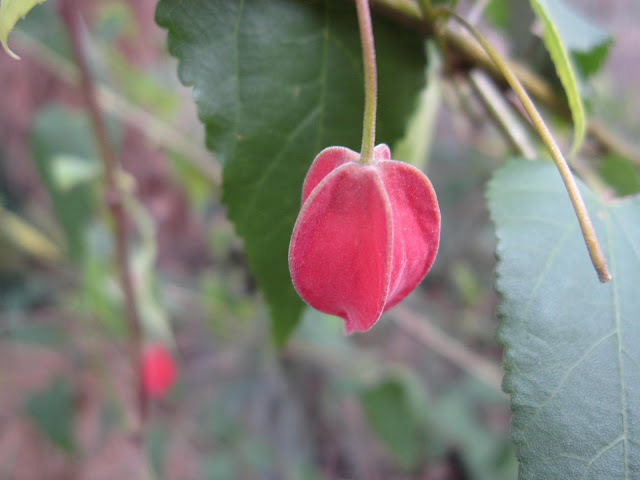 Abutilon megapotamicum blossoms are another sign of our (so far) mild winter. 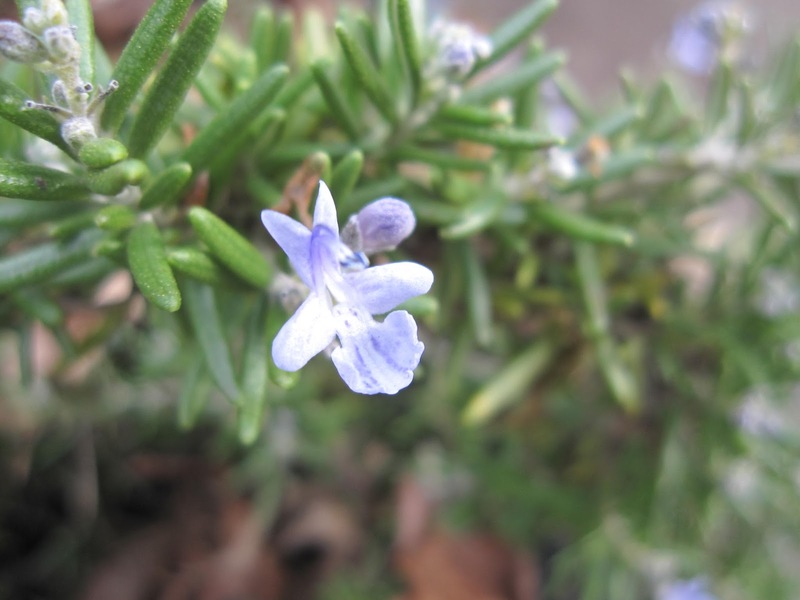 A few individual flowers persist on Rosemarinus officinalis 'Bonny Jean'. In case you were wondering, I will not be calling it Salvia any time in the near future. 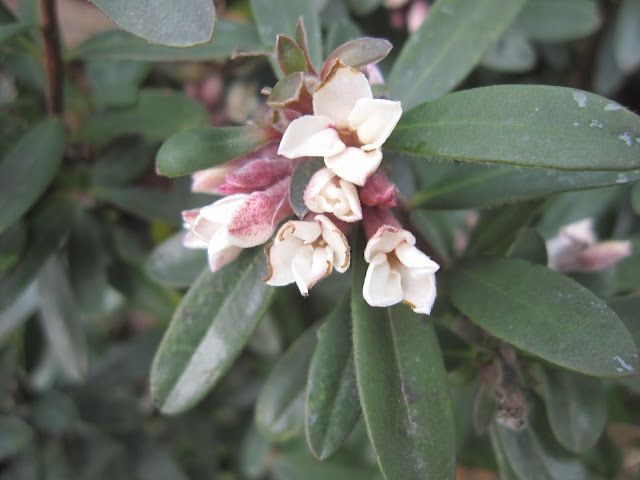 The faithful Daphne 'Eternal Fragrance' blooms on through winter. 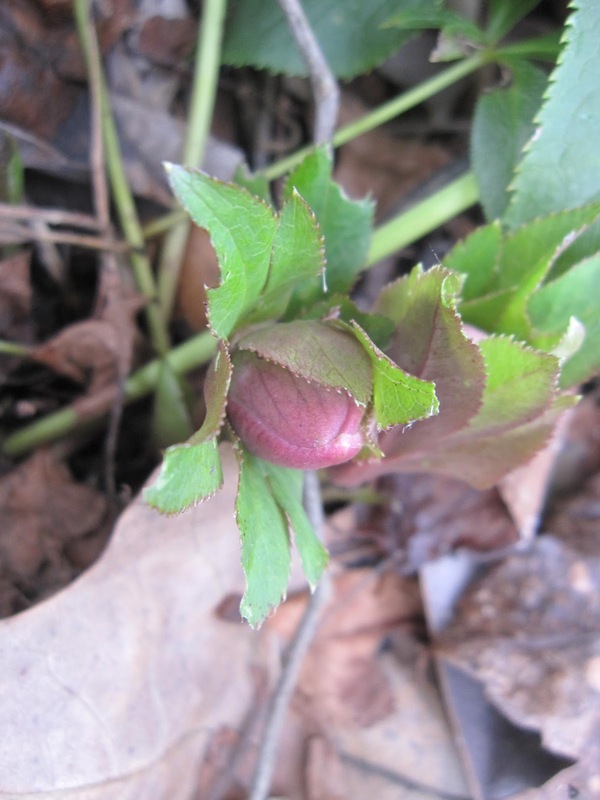 My Hellebores are in deep shade, so they're always later than most people's. I just have fat buds, right now. 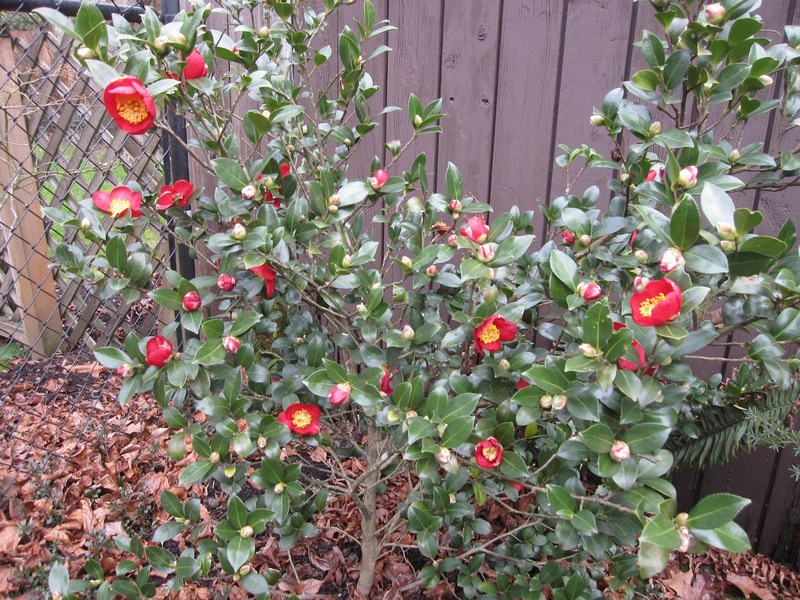 I'll close with the colorful buds of Camellia transnokoensis. When they do finally open, the flowers are almost pure white. Bloom Day is sponsored by the lovely Carol, at May Dreams Gardens. 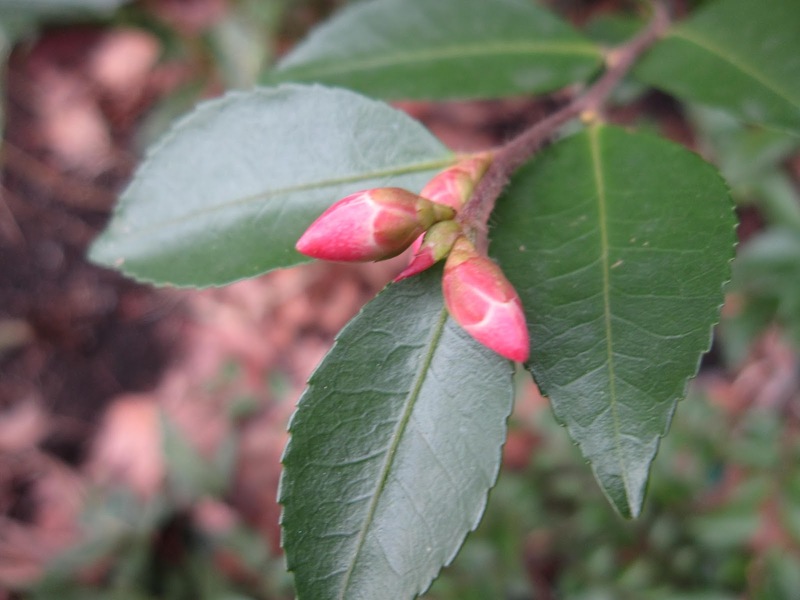 Hop over there to see what's blooming elsewhere on this winter's day. 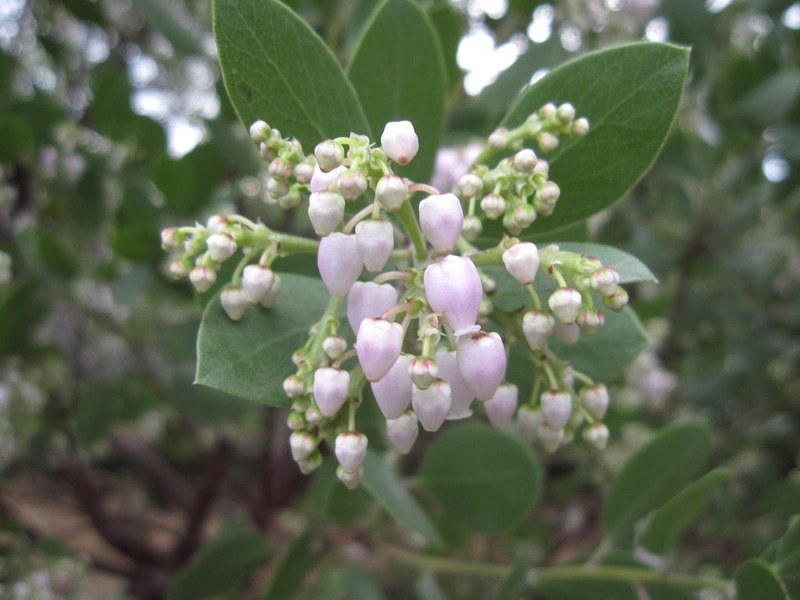 To kick off their brand-new book, co-authors Paul Bonine and Amy Campion are speaking together at the Hardy Plant Society of Oregon's (HPSO) Winter Program on January 21. 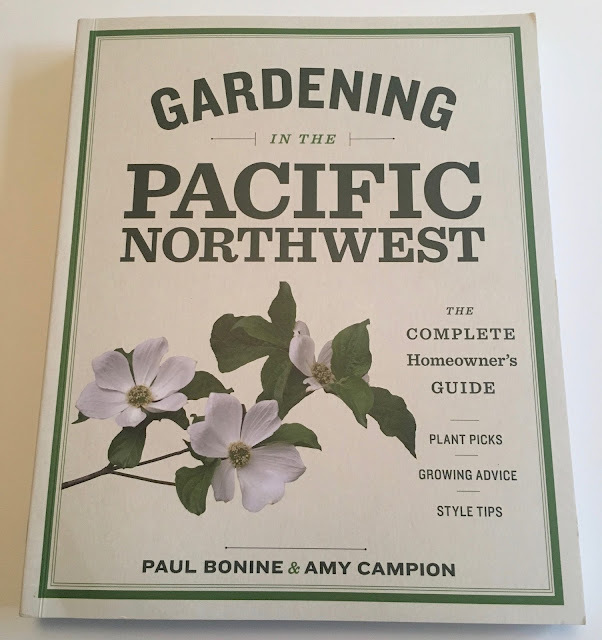 Gardening in the Pacific Northwest: The Complete Homeowner's Guide, is Bonine and Campion's newly-published Timber Press book. 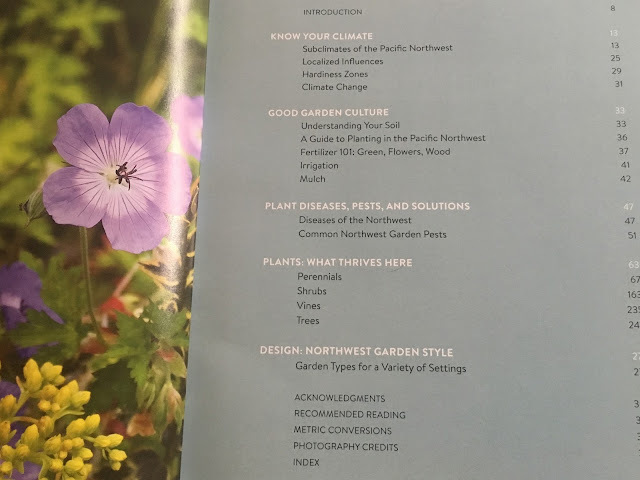 I'm pretty excited about this guide because, looking through my copy, I can see that it will serve both as great inspiration and a valuable, ongoing reference for me and others who garden in the PNW. There's something for every gardener in this book, from new homeowners to experienced gardeners. Here are five great reasons you'll want to hear the authors in person on the 21st! Paul and Amy will be speaking on the latest information about gardening in our area - the beautiful and temperate Pacific Northwest. 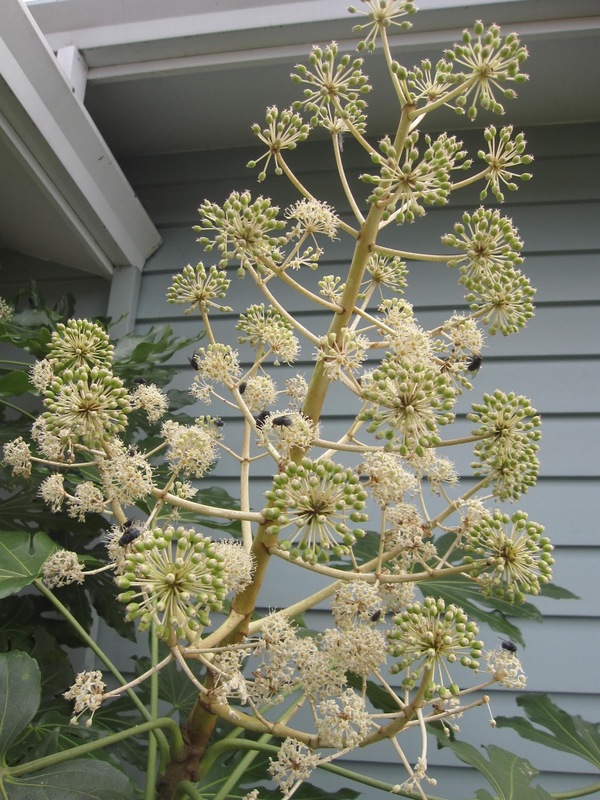 If their book is any indication, they will discuss lesser-known and newer varieties that are increasingly appropriate for our cool, wet winters and dry, mediterranean summers. Based on the table of contents, they may also address garden culture and northwest garden style. Whatever they talk about, you can be sure it will be germane to our climate. Both speakers are based right here in Portland, Oregon. Paul Bonine has a lifetime of experience as a nurseryman in the PNW and is co-owner of Xera Plants, Inc - a wholesale source of excellent plants for our climate - and the Xera shop in Southeast Portland. Amy Campion worked for years in nurseries and is a talented writer, editor and photographer, as well as a knowledgeable and intrepid gardener. 3) It's January for goodness sake! Don't you need a garden fix? Even if you have a greenhouse, there's not a lot happening at this point in the year, garden-wise. If you're anything like me, you are already suffering from GTD - gardening-time deprivation. Why not connect with your gardening cohorts and get stoked for the coming garden season? Paul and Amy will have copies of the book available, and will be signing it at this event. You save the shopping time, the shipping costs and get two gardening rock-star autographs at the same time! 5) You could get in for free! Join HPSO as a new member by January 19, and get free admission to the Winter Program! 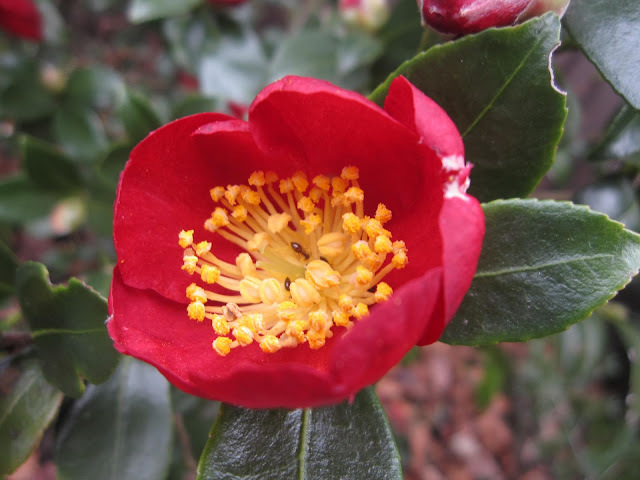 Join here: http://www.hardyplantsociety.org/become-a-member. If you're already a member, the program is just $10. Non-member admission is $20. The program takes place Sunday, January 21, 2018 at 1pm, at Portland State University, Hoffmann Hall, 1833 SW 11th Avenue, Portland, OR. Registration is available here: https://tinyurl.com/hpso-winter-program-2018. As you can probably tell, I'm looking forward to attending this program; I hope to see many of my local gardening friends there, too!